Water-Resistant Sorbothane® is an innovation that provides shock and vibration protection in any wet environment application. The Sorbothane engineering team developed this unique formula to make Sorbothane® resistant to water while still maintaining its ability to decrease shock and control vibration. Sorbothane® is a proprietary viscoelastic material that has been specified by engineers worldwide for almost three decades. Unlike other shock absorption materials, Sorbothane® maintains stability over a wide temperature range and has near faultless memory even after continual compressions. The shock, vibration damping and isolation properties have been scientifically tested and real world proven. Sorbothane® achieves shock absorption levels of up to 94.7%, making it the superior material for engineering applications. At Sorbothane, Inc., we offer custom sizes, colors and thicknesses of Water-Resistant Sorbothane® to fit your project requirements. Whether your project is big or small, we can manufacture the perfect solution for your vibration damping or shock absorbing needs. Sorbothane® continues to be the innovative and trusted choice of engineers worldwide for developing water-resistant vibration absorbing materials. 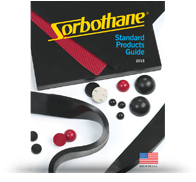 View the Sorbothane® Engineering Design Guide for additional information. Call Sorbothane for availability and pricing.